Raleigh, NC Homes for Sale Explore Homes for Sale in Raleigh, NC! Raleigh is not only the home of NC State but the state capital of North Carolina as well. Raleigh and its surrounding suburbs have seen record growth over the last couple of decades with the development of the Research Triangle Park. Raleigh is nestled in the center of the state and is just a short drive to the ocean and a little further drive to the mountains. It and the surrounding communities have received many accolades including, The Best Quality of Life by Portfolio.com (May 2010), 3rd Best Area of Business by Forbes Magazine (April 2010), 3rd Best Place to Start a Business by Fortune (October 2009), designated as a Post Recession Mecca for the Young according to the Wall Street Journal (September 2009) and the list goes on. Although starting a career in Raleigh is one of the primary reasons to live in the city, there are a plethora of other benefits available to you. There are a variety of neighborhoods throughout the area that deliver a fantastic living situation, which is particularly enticing for families. The parks around the area are some of the best in the state, while the shopping destinations within the city include a number of wonderful shops. Quiet neighborhoods lined with oak trees and beautiful architecture are the predominant areas for real estate in Raleigh, NC. Here, you’ll find stunning homes for sale that offer premium amenities the whole family will enjoy. Because Raleigh is within North Carolina’s Research Triangle, you’ll find plenty of high-tech gadgets for your home. Relaxation and entertainment are the main themes for the majority of homes for sale in the area. That means you’ll have plenty of space to stretch out and unwind. Perhaps you enjoy reading your novels in a comfortable corner of the master suite or you enjoy hosting dinner parties in the open kitchen. If you are searching for a nice private school for your child, then look no further than the Cathedral School, Our Lady of Lourdes Elementary School, and Friendship Christian School. 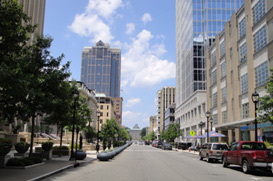 In addition to the public and private schools in Raleigh, the city also benefits from the proximity to Duke University, North Carolina State University, Wake Forest University, and the University of North Carolina (Chapel Hill). With quality educational programs in place, Raleigh continues to be a place where families want their children to receive their education. Raleigh is the perfect location for anyone, as the city plays host to a wide range of fantastic parks and recreational areas. If you’re looking for a beautiful nature setting to take your kids to play or have a family picnic, the William B. Umstead State Park and the Durant Nature Park offer enough play areas and hiking trails to please anyone. Raleigh is also home to the annual state fair. No matter what you’re shopping for, Raleigh has it all. From antique shops to flea markets and shopping malls, Raleigh is home to some of the best and most unique shopping experiences in the country. As for dining, whether you’re looking for a BBQ joint or a luxurious upscale restaurant, Raleigh has a plethora of options to offer, including the elegant Second Empire Restaurant and Tavern, as well as Sullivan’s Steakhouse. It’s clear that Raleigh has a ton of perks and advantages to offer for anyone thinking of moving there. Whether you’re a family looking to buy the perfect home for the kids to grow up in or a businessperson going through a relocation to the area, Raleigh is the city for you.